Games getting DLC is not unusual these days, it hasn’t been for a decade. So it doesn’t surprise me that Final Fantasy XV has DLC. I wish it didn’t, but it does. My problem is not that the game has DLC, it’s the content of the DLC that bugs me. Late last year it was revealed that Final Fantasy XV would receive four content expansions over the course of 2017. Three of those expansions are centered around the other three members of the games party. In the main game they were not playable, just AI controlled, which fans were not happy about. So these episodes gave them the ability to play as these characters, but the kicker is that these episodes are actually chunks of the story that were carved out in advance to make the DLC. There are three moments in the game where one party member disappears for one reason or another and it is during those moments that these DLC chapters take place. It’d be different if it weren’t so blatantly obvious that they were cut out on purpose, but it is and there isn’t anything we can do about that. I wouldn’t really call them critical parts of the story, but it might not have been a bad idea to have them in there so players could see things from their perspective and fill those gaps. Of course, Square has also committed to some free DLC. Free is great right? Well yes and no. Yes because it means they’re just giving it to us, but no because the content of these updates are things that should have been in the game to begin with. So far we’ve gotten one such update which added an alternative route to Chapter 13, turning it from a long slog through a decent, but ultimately failed horror level attempt, to an action-packed and quick run with some additional story details that somewhat explain what the heck was going on, and even then there are still some blanks. I’m sure you can tell where I’m gonna go with this, but let me say it flat out: At least half of this should already have been in the game. Ardyn got enough screentime over the course of the game to come off as one of the best Final Fantasy antagonists in recent memory, but I know to some that they still didn’t understand him or were just confused in general, which is why I wrote an article explaining his backstory which could be gleaned from multiple outside sources as well as reading in between the lines. Chapter 14's World of Ruin had so much potential, yet all we got to explore where Galdin Quay and Hammerhead Station. That was it. And it was really short. Once you left Hammerhead, the game quickly transitioned to Chapter 15 and the city of Insomnia for the home stretch of the story. If you want to know about the rest of the world, you talk to the other characters standing around and they just explain the situation to you, but you never get to see it for yourself. And let us not forget the tragedy of Lunafreya. She was the games female lead, the main characters romantic interest, but she’s off screen for half the game unless you manage to find the one or two cutscenes with her in it before getting to the halfway point. And then she dies and we’re supposed to cry buckets of tears for these tragic lovers. 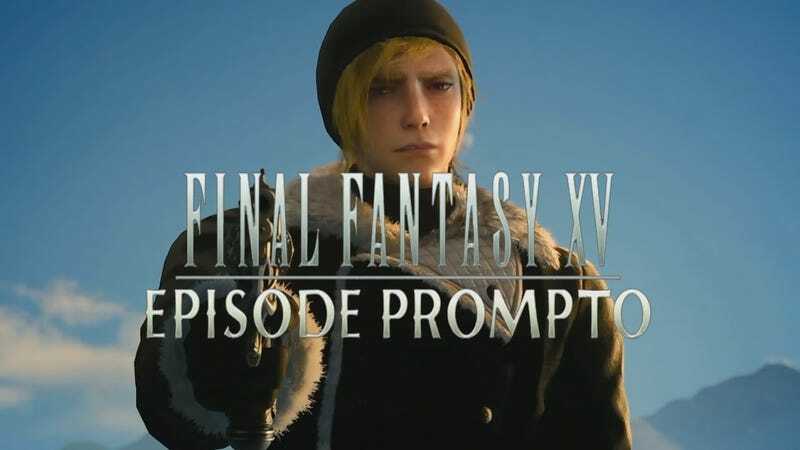 You might care about Noctis by this point or you might not, but you probably don’t really have an attachment to Luna so if you feel anything it’s pity for Noctis. You get some cutscenes after the fact, but it’s too late to make a significant difference. Characters being playable and gameplay improvements are negligible by comparison to the needs of the story. I hate that Square Enix is treating important parts of the story like an afterthought. I appreciate that they’ll likely be free updates, but this is stuff that would have really helped the game out if they were already present in it. Now it might be too late to salvage these characters and story, at least to some degree. For all my complaining about how Square is handling this game post-release, I’m still glad they’re willing to do something. Most developers would have dropped the game and said “what you see is what you get, deal with it.” So they have my appreciation for trying to patch the holes in the story. I actually like the story and the characters and I want others to come to like it as much as I do, but they need to avoid doing this sort of stuff in the future because first impressions are important. They blew it on release, so now they have to redeem themselves. Personally I voted for more Lunafreya content. Information about Ardyn’s Past is out there, you just have to look for it(Though you shouldn’t have too. ), and that is probably the second thing that I would want to be added to the game. But Lunafreya doesn’t even have that external information. You can glean bits from the post-2014 trailers, but nothing beyond that. And everything else save The World of Ruin isn’t nearly as necessary to the overall story. We don’t need to know what Cor decided to eat for lunch while the main party was away or what Noctis was up to after he disappeared(I’ll give you a hint: He disappeared.). Granted, I could be misinterpreting that one, it could be about what everyone else was doing while he was gone, how they reacted to his absence, and I would definitely love that. But again, it isn’t as important as fleshing out a character that is supposed to matter and doesn’t get the necessary screentime to achieve that. What do all of you think about this? Do you think Square handled this very poorly? Or are you perhaps more forgiving or just don’t care?